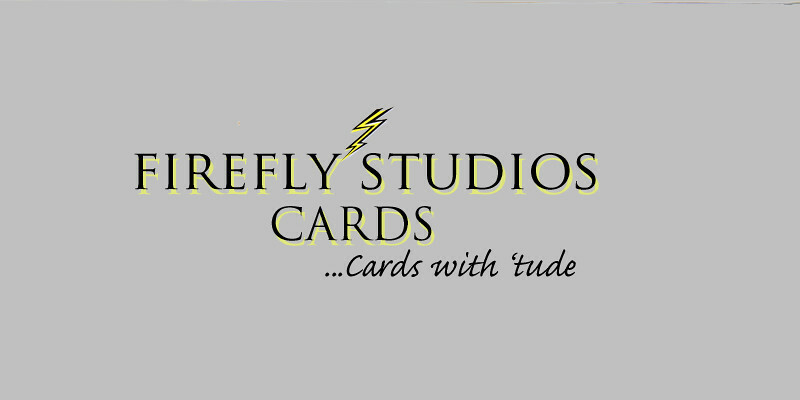 There are two sides to Firefly Studios Cards. We offer custom cards made to meet your wants and needs. Business is personal and we help you reach your customers in a unique and personal way. You can have cards with your branding on the back panel. The cards will have your words, your messages, what you wish to express to your customers. The front is a beautifully printed photograph from our stock that you have chosen to match your message. These are not your standard mass produced cards. But they are at price point that is reasonable and affordable. Give us a call and let us help you design a card that will make an impact. Our cards have a bit of an attitude. They are sassy, funny, quirky, and different. We are unique and slightly off-center so, of course, our cards will be too. If you want to say something to someone we think you should really say something not just send a piece of ill printed paper. Cards are personal or at least they can be. Put a smile on someone's face, even if it's just yours. Click on pictures to the left in order to view the card. then Inside wording is listed underneath. We are just a click or call away if you have any questions.